Sally Roberts, Executive Director of Wrestle Like a Girl, kicks off the 2018 Midwest Nationals Wrestling Tournament. The LiUNA Midwest Nationals Wrestling Tournament was created in 2004. 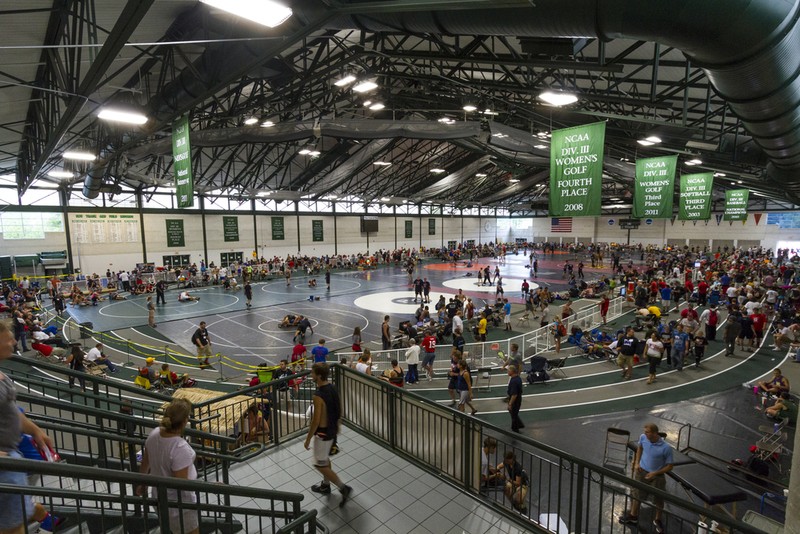 The Midwest Nationals attract local youth and other wrestlers from across the country on the second Saturday of July each year. 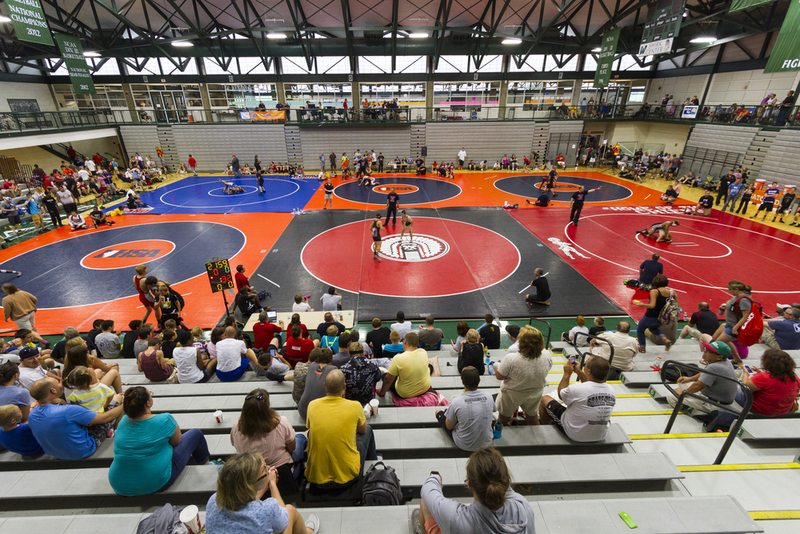 The mission of the Midwest Nationals Wrestling Tournament is to provide a competitive, professionally-conducted amateur wrestling tournament, generate tourism to the Bloomington-Normal area, and promote the growth and development of the sport of wrestling. Since 2004, the Midwest Nationals has strived to provide a positive, competitive environment for amateur wrestlers from 1st grade up through college and above. In conjunction with community leaders and businesses, the Midwest Nationals creates an event that brings athletes and their families from all over the country to Bloomington-Normal to generate tourism and positively impact the local economy. Lee Kemp - Coached the USA Wrestling Olympic team to victory in Beijing (2008); was also an Olympian (1980), 3x World Champion (1978, 1979, 1982), and one of five Americans inducted to the International Wrestling Hall of Fame. The LiUNA Midwest Nationals Wrestling Tournament has always helped support some of the people and organizations which make Bloomington-Normal great. Our belief is by investing in our community, we contribute to a strong, healthy and bright future for children and families. We have a strong history of giving back to the community by contributing resources to organizations that share our commitment to youth education, health, and wellness. Tournament will be double elimination with wrestle backs to 3rd place. Uniforms: Headgear, singlets, and wrestling shoes are recommended but not required. Athletes must be prepared and must submit to a Skin Disease screening at weigh-in. The Chief Medical Officer’s decision is final and not subject to appeal. All athletes will be required to weigh-in once on Friday, July 12th from 5:00–8:00p.m. at the Illinois Wesleyan University Shirk Center. There will be an optional weigh-in on from 12:00-2:00pm on July 12. The early weigh-in fee is $20. There are no predetermined weight classes for this event. Weights will be blocked after weigh-ins are complete. Trophies will be presented to the top team in each division. A maximum of 12 wrestlers can be counted towards team scores. Championship belts will be given to the 1st place finisher in each weight class. The black/silver belts will given to 1st place finishers in the 9th grade - college divisions. The black/gold belts will be given to 1st place finishers in 1st - 8th grade divisions. Medals will be given to the 2nd-6th place individuals in each weight class. Weight classes will be determined (blocked) at weigh-ins (all weight classes in pounds). $50 entry fee per person for all divisions. The tournament will be broadcast live at trackwrestling.com. Coach Passes are $15 each and allow that coach access to the mat during their participant's match, as well as serve as your admission pass. Adult admission 14 & up is $10. Youth admission 6–13 is $3. Youth admission 5 and under is free. Air conditioning is available in the main gym. The field house area and concourse are not air conditioned. Participants and attendees are not permitted to bring in their own food, drink, or coolers. A concession stand will be open during the tournament. Entry: $50 entry fee per person for all divisions. Registration can be completed online at TrackWrestling or by paper form. The paper form can be downloaded as a word document here, or as a PDF here. Wrestlers should register for the grade that was most recently completed. There are not predetermined weight classes for this event. Weights will be blocked after weigh-ins are complete. The form must be accurately completed and filed at registration. The entry fee will be $50 per individual. Registration is available on-site during weigh-ins on July 12th from 5:00–8:00p.m. Cash and checks are accepted on-site (no online registration or credit cards accepted on-site during weigh-ins). Wrestlers in divisions 1st/2nd, 3rd/4th, 5th/6th, and 7th/8th grades should report to the Shirk Center at 8:00am, with wrestling beginning at 9:00am. Wrestlers in divisions 9th/10th, 11th/12th grades, and college/open should report to the Shirk Center at 11:00am, with wrestling beginning at 12:00pm.